Although I'm not a fan of the genre, I have to say that it was not as bad as I usually expect from horror movies. I watched it with no expectations whatsoever, and it was actually a mildly pleasant experience. 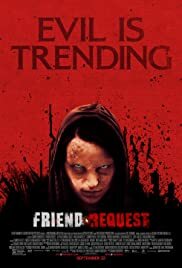 The movie revolves around the dark side of social media, how a lonely girl with no friends sends a friend request to a popular girl with a lot of friends, and it all kinda spirals from that. There are decent jump scares, the plot is a bit of a mess in my opinion, but the acting is quite good, with the lovely Alycia Debnam-Carey as the lead. It is well directed and the camera work is actually very good. If you like this genre, you'll probably like this one. It's not as boring and thoughtless as most horror movies, and the theme is new and modern.